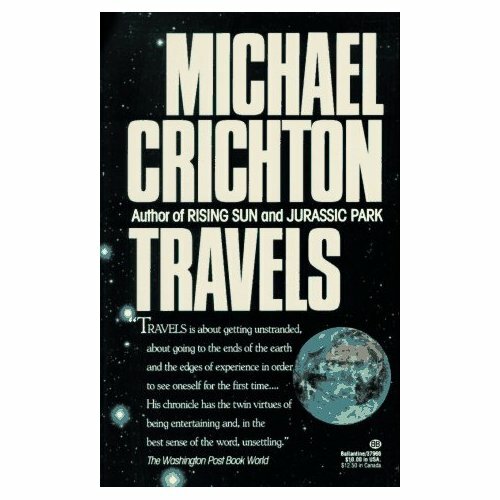 The first novels I ever read were by Michael Crichton. Jurassic Park, The Lost World and Congo transported my imagination away to exotic locations, partaking in adventures that seemed almost impossible in reality. Talking monkeys and dinosaur theme parks are were fictitious, but never far from a future reality in the age of embryonic manipulation and rapid technological development we’ve found ourselves in. I’d always thought of the author of having a productivity rate equal to his creative cognition- a Steven King type who seemingly never left his typewriter, furiously churning out novels leaving little time for sleep or toilet breaks. Years later, one sunny day in Brighton, England, I was intrigued to find a tattered, autobiographical account of his personal global adventures in the bargain bin of a second hand bookstore. Since most of his works get the movie makeover, i was perplexed that this title had only just come to my attention. The first series of chapters charts his early medical work whilst studying at Harvard Medical School. Disillusioned by the strict symptom/cure order of his studies and believing most diseases are brought on by the patients themselves, he abandons his career path to become a full-time writer. We are then invited to follow him along to locations he’s visited on personal or working agendas. During these trips he experiments with various conscious-expanding methods to explore the power of the human psyche and the ways we perceive the outside world. In this respect, Travels is two-tiered: explorations of both the physical and psychological realm. From swimming with sharks, encountering headhunters and gorillas or trying to shake a criminal on the run in Jamaica, his travel stories are intoxicating as they are inspiring. As he goes into each of his endeavors with a refreshingly open mind, it becomes clear that he is a born explorer, and not merely of a geographical nature. Be it from the underbelly of Bangkok to the heights of Kilimanjaro, it seems that the further he goes from home, the closer he arrives to a sense of his inner self through various ancient mystical practices. His journeys into the workings of the human psyche through traditions frowned upon by modern doctrines are always guided by a sense of rationalism. His scientific, proof-led sensibilities are regularly cut loose by his free thinking, unconstrained sense of curiosity. He believed that modern humans have lost the power to use their minds in a way that some ancient cultures did so successfully. He sees practices such as tarot reading and the I Ching as purely working toward a Freudian wish-fulfillment driven impulse, whereas he admits to becoming adept at reading peoples’ auras. These ‘direct experiences’ he speaks of are unfiltered event being perceived by the self with no relation to influences outside of the moment. It’s a concept that we’re becoming increasingly isolated from in an era where everything we see has the technological potential of being so quickly documented and shared. As easy as it is to exist in an established, orderly society, to travel outside of our comfort zones and react to situations and people that are unfamiliar, confusing and sometimes dangerous tests what we have become, what we are made of and what we have made of ourselves. Whether it’s Chrichton’s inner or outer travels, he concludes each tale by summarizing what was gained from these direct experiences, and the wisdom, if any, he attained. Travels must surely be among Crichton’s most underrated works and a true cult classic of travel writing. I also vividly recall finding books like Jurassic Park and Congo fascinating, and JP was definitely one of the first novels I found absolutely engrossing! I will have to make it my business to find a copy of this. I was lucky enough to come across it in a bookshop, I’m not sure you’d have the same luck in Korea but you never know! I read this years ago and loved it.